Pokerfornia.com is currently the best SEO (Search Engine Optimized) website dedicated to poker in California. Although the site is sill young, it is rapidly imposing itself as the authority site for poker players in CA. It currently ranks first for “California Poker” in the Google Search Engine. 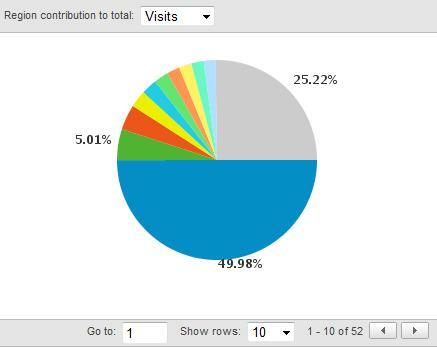 Pokerfornia currently receives 4k unique visitors a month, as observed using the Google Analytics Tool. With new content being added aggressively, this number is expected to multiply in the coming months. The total number of page views varies, resides in the 10K range per month. Our focus is the US market, and as such, 92.88% of our traffic comes from within the USA, predominantly from California. 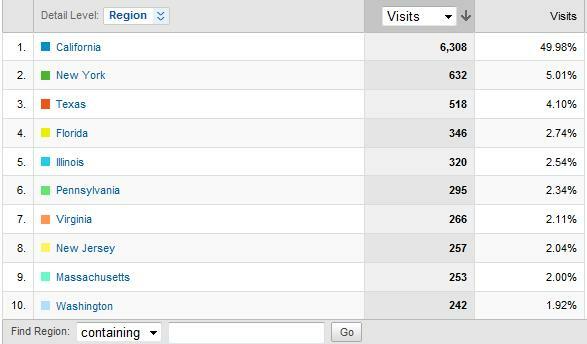 Here is the breakdown of our traffic on a per state basis across a sample size of 6,000 visits. California provides ten times more visitors to Pokerfornia then the second source of traffic which is New York. Ad placements can be negotiated to appear on the Pokerfornia header or on the left sidebar. Please formalize your interest by adding a comment in the box underneath. Comments will not be displayed publicly and are only accessible by the website owners. We will then contact you to work out the best advertising package for you. This entry was posted on Sunday, March 22nd, 2009 at 5:42 am	and is filed under California Poker, Online News. You can follow any responses to this entry through the RSS 2.0 feed. You can leave a response, or trackback from your own site.